On 15 April 1989, during the opening minutes of the FA Cup semi-final between Nottingham Forest and Liverpool, 96 men, women and children died in what remains the most serious tragedy in UK sporting history – the Hillsborough Stadium disaster. Thousands more suffered physical injury and long-term psychological harm. For almost thirty years the survivors and the families of the dead had to campaign against the police, government and media who blamed the supporters for the tragedy. Eventually, in 2016 a second inquest ruled that the supporters were unlawfully killed due to failures of the police and ambulance services. In June 2017, six people were charged with manslaughter by gross negligence, misconduct in public office and perverting the course of justice. Published to mark the 30th anniversary of the disaster, Truth Street combines the eye-witness testimonies of the survivors at the second inquest to create an epic-poem that is part oral history and part documentary theatre. Inspired by the work of Charles Reznikoff and Svetlana Alexievich, Truth Street was first performed in 2017 at the Utter Lutonia festival and the Brighton Festival. This massive surge from behind came. It was violent and sudden. And sent us scuttling down towards the front of the pens. I was pushed down the terracing. It was coming from behind me on the left. Suddenly entering the terracing from the centre tunnel. Pushing the people that were already standing there forward. The scene reminded me of pictures on television in the nature programmes. Molten lava flowing down a hillside from an active volcano. I have never felt anything like it in my life. I wanted my big brother to help me. My main focus was trying to breathe. It was a battle to try and stay on your feet. Trying to protect him from the pressure. And he had a look of just sheer terror on his face. I just said to him that he would be okay. Concerned for my dad, for myself. Then there was a sudden surge from the back. With bodies just pressed from all sides against me. That is the last time I had my father alive. It was just an eerie sound. It probably only lasted a second or two. But it felt like a lot longer. It’s hard to describe the sound. I’ve never heard the sound since. As it seemed to settle, people started screaming and panicking. It wasn’t nice. It was people screaming, people crying all at the same time. The noise is almost impossible to describe. People shouting to the pitch side for help. It was so hot. The smell was terrible and lingered in the air. Is it the smell of death? I hadn’t seen him for quite a while, since we left school. It was a strange place to meet someone. It was just getting worse and worse. There was nothing I could do for him . He was bent very far forward over the barrier. He looked around and his face was very, very red. His eyes were very wide, distress and panic on his face. It was right across his hips and his stomach. I was trying to pull him back, trying to pull him upright and pull him away from the barrier. There was that much pressure coming from the tunnel behind us. I shouted, screamed for people to help. And all these hands came over him from behind. And started pulling him back off the barrier as best as they could. Even given the distress that people were in themselves. They were still doing everything they could to help others. His legs were going to break. He was in a great deal of distress. I couldn’t hold onto his hand anymore. My whole world was in that one pen at that moment. And the man in front was screaming about his legs being trapped. He was just pinned against the barrier. I heard his knee crack. And my body went over the top. And I had my arms trapped under his armpits. Trying to push people back into the pen. I produced my warrant card. I held it up in the air. I said, ‘Why wasn’t they letting people out? 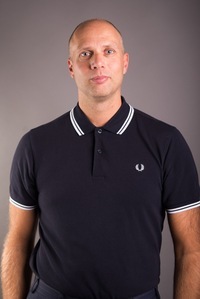 David Cain leads sporting and social history projects across the East of England using literature and art to explore history. 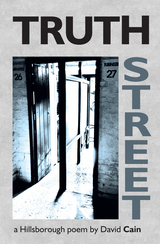 Truth Street is his first book. He lives in Suffolk.